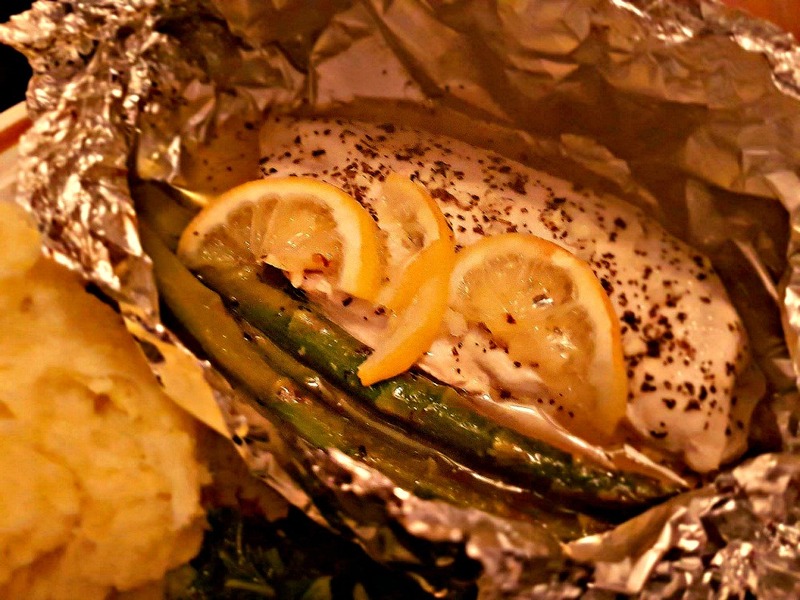 I do like cooking meals in foil parcels – it’s a great method for midweek meals. 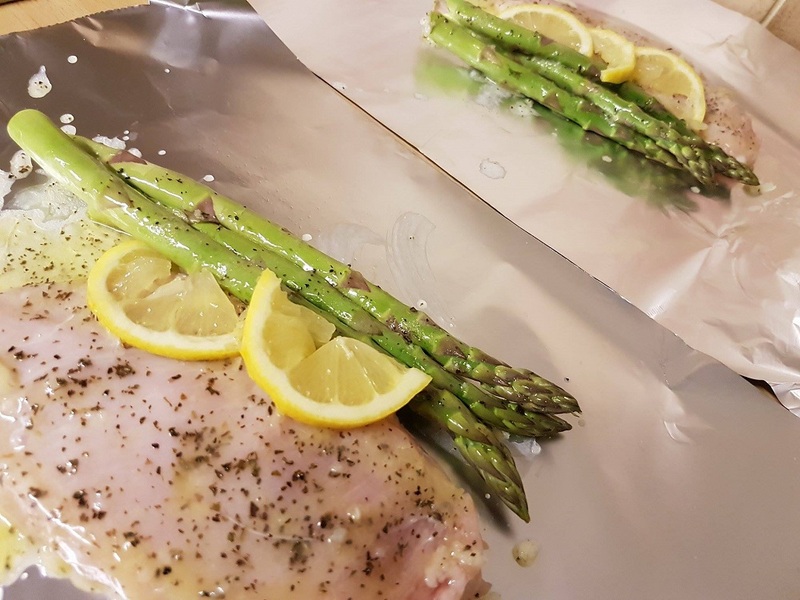 You can prep in the morning, leave the foil packets in the fridge all day and then pop them in the oven when you get home from work. As long as you seal the foil packets properly then with these ones you’ll end up with lovely lemony buttery juices in the finished parcel that you can pour over mashed potatoes. 1. Preheat the oven to 400F, 200C. 2. Place one chicken breast and three asparagus spears on to each foil square. 3. Cut the lemon in half. Slice one of the halves thinly and share the slices out between the four chicken breasts. 4. Squeeze the juice from the other half of the lemon and mix it with the melted butter, garlic and herbs. Brush this over all the chicken breasts, use it all up. 5. Grind salt and pepper over the chicken to taste. 7. Place the parcels spread out on a baking tray and cook in the preheated oven for 20 mins. Carefully open the top of one parcel and cut a little into the centre of the chicken to check it’s cooked through. I served these with mashed potatoes and a side salad. 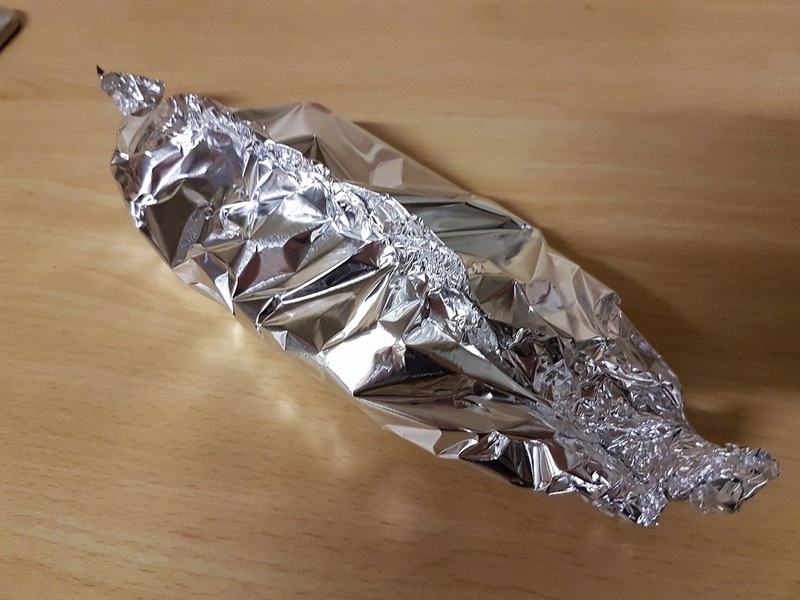 Whenever I make foil parcel meals, I tend to just put the foil parcel straight on the plate, then people have the surprise of opening it up and seeing what’s inside, and also the option of pouring the juices on to their potatoes, or not. Do take care opening the parcels though because hot steam will emerge. Clever way to prep ahead. I used to do something similar with crushed pineapple and chicken. Haven’t done it in years. I love cooking where you prep ahead, hence why I love my crock pot too! easy and yummy … yes! Love easy mid-week meals. Especially on those days when I’m out of the house and have no time to prepare a proper meal. I shall try this! Yes and this sort of thing is really so quick and easy, there’s no excuse for buying something ready-prepared! (I’m not saying I never do, but it’s just when I make something like this I remember that there’s really no need to!). I actually tend to prefer the thighs than the breast generally, but I think the breast is healthier really and it’s a nice size for one serving. Yes you’re right, I never think of the grill for things like this! This is my kind of cooking! Thanks for the tip on the chicken bashing. Is the idea that it makes the meat the same thickness so it cooks evenly? I don’t cook a lot of meat so forgive me if that is a ridiculously simple question. Yes that’s the general idea. Don’t bash it too hard though, it’s not steak, it will break apart of you’re too vigorous with your bashing! Best to find other ways to relieve frustrations.